Who is junglee (uncultured, wild)? Is it the mannered, wealthy people who live lives according to the rules of society, who suppress all joy and happiness in exchange for great riches. Or those of less wealth, who are less restricted by society, who are capable of experiencing joy, happiness and love? Junglee means ill-mannered or wild. The english word “jungle” is a cognate given to us by the Hindi (and Sanskrit) word, jangal (pronounced the same as jungle). In hindi, it jangal just means forest. Junglee is about a man named Chandrashekhar (Shammi Kapoor), a hard hearted businessman who comes from a very wealthy family. He runs a very successful international business. He comes from a family of such esteem that from the age of seven he has been engaged to a princess. His father arranged the marriage. But his father is now dead, and his mother expects him to fulfill the wishes of his father. Something he is perfectly happy to do. But Shekhar’s sister, Mala (Shashikala) is in love, a scandalous thing for this family. She is in love with one of Shekhar’s clerks. It is bad enough that she is pursuing love and running around with a man, but what is even worse, he is from a lower class. If this were to come to light, the town would all be talking about it, and Shekhar’s marriage plans would be jeopardized. Shekhar takes his sister away to Kashmir to keep the scandal private until he can be married. While in Kashmir, he meets and falls in love with the village doctor’s daughter, Rajkumari (Saira Banu). Most of the characters in the film are caricatures. Chandrashekhar begins the film as an evil boss, played to such a level that I asked Puja if he was supposed to be a bad boss or a buffoon. Was he acting the way he was toward his subordinates to cover up for his idiocy? No. Although Kapoor was playing the anger to a comic level, as a character it turns out we were supposed to take him as an angry but successful man. Later, when he falls in love, he comes back a changed man. He is not longer an angry buffoon, but a man overflowing with love and generosity. He suddenly begins eating lunch with his subordinates and gives out raises and promotions. Hindi filmmaking has changed a lot since the time of Junglee, but not always for the better. You can see the seeds of modern film all over Junglee: the story of a man breaking class and defying his family’s wishes for love, as well as the many breaks for song and dance. Much time in the movie was spent showing off the beautiful scenery of Kashmir. Then, finally, near the end of the movie there was a highly choreographed dance performance starring Helen Jairag Richardson (known simply as “Helen”). This is the still common “item number” of today’s films, minus the overdone production and sexuality. 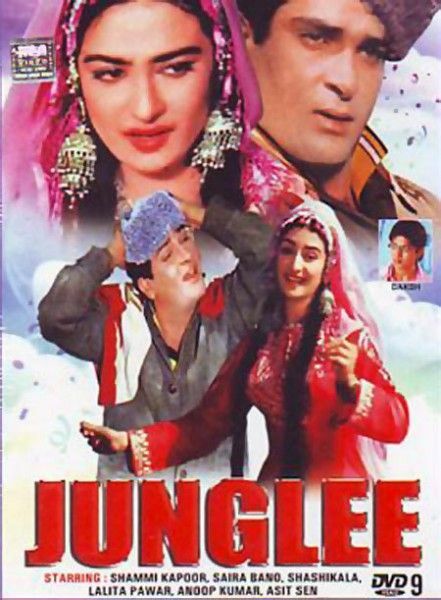 Junglee is a well-loved classic Hindi movie. It is more than fifty years old, and to appreciate it you have to allow yourself to overlook some of its glaring faults. If you are interested in the history of Hindi film, Junglee is a must see. Comments on "Junglee – Hindi Movie Classic"